In June 2014 Country Life featured the rescue of the garden High Glenau, which has been loving restored by the Gerrish family. The house was built in the Arts and Crafts style in 1922-23 by the architect Eric Francis, of Chepstow, for Henry Avray Tipping. Avray Tipping was a renowned architectural writer, the editor of Country Life magazine, and a garden designer among whose friends were Gertrude Jekyll and Harold Peto. Tipping lived at Mounton House near Chepstow, but sought a new home for his retirement. The front of the house is of two storeys, with three slate-hung gables between two chimney stacks. On the upper entrance side there is a broad slate roof with a pair of gabled turrets. 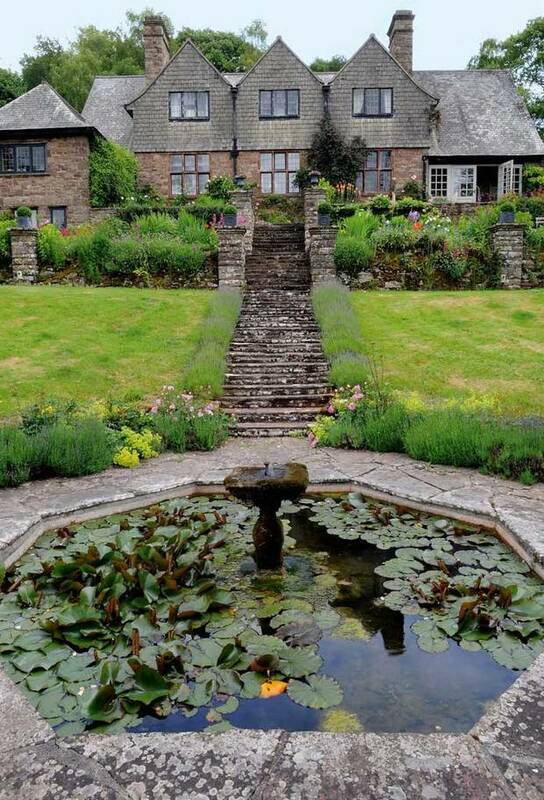 The house is set above formal gardens, with stone-walled terraces and an octagonal pond. The gardens were created by Tipping between 1922 and 1929. Original features incl impressive stone terraces with far reaching views over the Vale of Usk to Blorenge, Skirrid, Sugar Loaf and Brecon Beacons. Pergola, herbaceous borders, Edwardian glasshouse, rhododendrons, azaleas, tulips, orchard with wild flowers and woodland walks. Several cottages around the estate were built by Francis for Tipping at about the same time. Avray Tipping moved to London in 1930, and died in 1933. 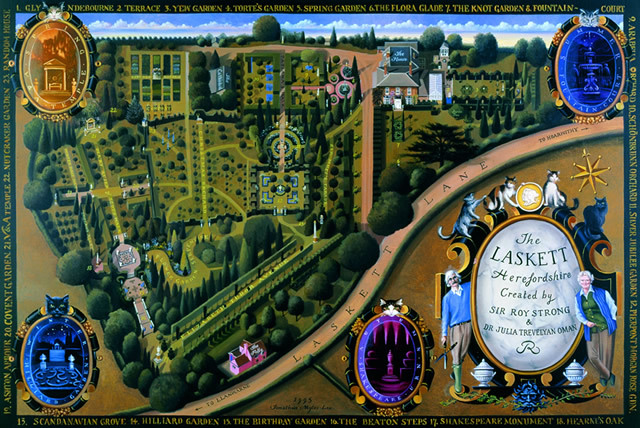 The Laskett Gardens are one of the largest private formal gardens to be created in England since 1945. In 1973 the recently married Roy Strong and Julia Trevelyan Oman purchased The Laskett, an early Victorian house midway between Hereford and Ross-on-Wye, set in the corner of a four acre triangle of land. Garden fever seized them early on and with little money and labour at their disposal, but with a cornucopia of ideas, they set out to make the garden you see today. Over almost four decades the historian, Sir Roy Strong, and his late wife, the designer Dr Julia Trevelyan Oman, transformed a four acre field into a series of stunning garden rooms, vistas, ascents and descents. These include a rose garden, pleached lime avenue, orchard, kitchen garden, knot garden, fountains, statuary and parterres as well as a spectacular array of topiary and rich herbaceous and prairie style borders. Uniquely, the garden tells the story of both their marriage and their creative lives in the arts. It was inspired by the great gardens of the pre-1914 era, by Italian gardens like the Villa Lante and by those of Tudor and Stuart England. As a result strong architectural structure abounds, underpinned by the emphasis on dramatic vistas and on surprise as a central concept. Herefordshire is apple country and the orchard with its collection of unusual varieties was at the heart of Julia’s garden making, as well as the kitchen garden which together supplied the house with fruit and vegetables. Roy’s fascination with early gardens accounts for the amazing topiary, the knot garden and the parterres, all lovingly clipped by him in the early years. The garden was paid for piecemeal by their labour in the arts, so there’s a Victoria & Albert Museum Temple to mark Roy’s directorship and an arbour in honour of the Royal Ballet’s great choreographer, Sir Frederick Ashton, two of whose most famous ballets Julia designed. An armillary sundial in the Jubilee Garden from Sir Cecil Beaton’s garden at Broadchalke recalls Roy’s friendship with the photographer while a crowned column presides over the lime avenue in commemoration of both Elizabeth I and II. Julia died in 2003 since when the gardens, after 30 years, needed radical pruning and thinning out to ensure their future in the new century, so hedges have been re-cut, the planting updated and vistas to the surrounding landscape opened up. The result has been to endow the Gardens with renewed energy. The whole garden is maintained by two gardeners four days a week.